The need for thoughtful histories on contemporary Canadian environmental issues has never been more critical than it is regarding the present state of the country’s fisheries. In June 2012, funding for fisheries-related research and protection was significantly curtailed as part of federal government cuts and amendments to the Fisheries Act included in the C-38 omnibus budget bill. These changes, however, are not unprecedented. By placing Canada’s fisheries and marine environments in greater jeopardy than they’ve ever been, the changes fit into a longer pattern of government undermining of the law that go back as far as the 1970s. In response, dozens of environmentalists, researchers and scientists have criticized the cuts as misinformed and dangerous. In a letter to the Globe and Mail soon after bill C-38 was announced, four former Fisheries and Oceans ministers wrote they believe these changes “will inevitably reduce and weaken the habitat-protection provisions” of the Fisheries Act. 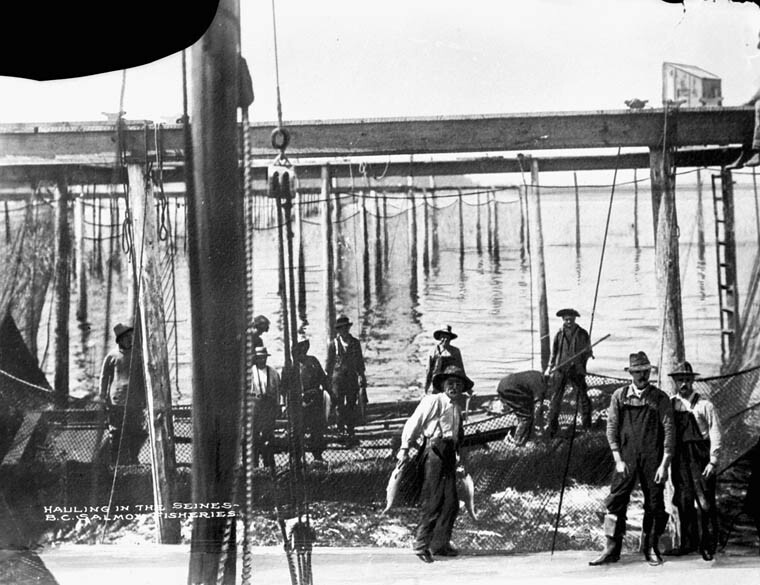 Canada’s fisheries have been subjects of controversy and sites of tension for over 200 years. On the east coast, small-scale, inshore fisheries (the norm since the seventeenth century) gave way to large-scale, scientifically-managed commercial fisheries. Technological advances, globalizing market structures, and an ever-increasing reliance on experts, created a context in which the Department of Fisheries and Oceans shifted the purpose of fisheries from meeting human needs to meeting maximum sustainable yields and total allowable catches. The result was the collapse of the North Atlantic cod fishery in the early 1990s. On the west coast, the defence of the salmon fishery against hydroelectric development on the Fraser River in the middle of the nineteenth century is one bright spot in a story of over-fishing, habitat loss, and the negative side-effects of commercial-scale aquaculture. The artificial state border between Canada and the United States in the Salish Sea, which did not reflect the migratory lives of pacific salmon, created the conditions for unmanageable fish banditry. Inland, freshwater fisheries have experienced similar stories of over-harvesting, threats to fish habitat, and denial of Native resource rights. Around the Great Lakes, First Nations experienced competition from non-native commercial fishermen as early as the 1830s, spent much of the late nineteenth century resisting efforts by the Ontario government to eliminate their traditional rights, and fought a series of legal battles during the twentieth century to regain autonomy over their fisheries. While certain species have begun to recover in the Great Lakes, several species found in Canada’s coastal waters have not. According to the Fisheries and Agriculture Organization of the United Nations, roughly 75% of global fish stocks are fully exploited or have collapsed. Canada has played a leading role in bringing us to the brink of global fisheries collapse. Given this scenario, insights from scholars writing on the history of fisheries in Canada is critical if further catastrophe is to be avoided. On this episode, we speak with five leading historians of Canadian fisheries, including Dean Bavington, Stephen Bocking, Douglas Harris, Will Knight, and Liza Piper. Arnason, R. and L. Felt, eds. The North Atlantic Fisheries: Successes, Failures, and Challenges. Charlottetown: University of Prince Edward Island Press, 1995. Bavington, Dean. Managed Annihilation: An Unnatural History of the Newfoundland Cod Collapse. Vancouver: UBC Press, 2010. Bocking, Stephen.”Science, Salmon, and Sea Lice: Constructing Practice and Place in an Environmental Controversy,” Journal of the History of Biology (2012) 45: 681–716. Bogue, Margaret Beattie. Fishing the Great Lakes: An Environmental History, 1783-1933. Madison: University of Wisconsin Press, 2000. Drews, Keven. “Changes to federal Fisheries Act draw fire from three B.C. scientists” Winnipeg Free Press, June 21, 2012. Galloway, Gloria. “Ex-Fisheries directors urge Harper to reverse freshwater-research cuts” Globe and Mail, June 22, 2012. Gough, Joseph. Managing Canada’s Fisheries: From Early Days to the Year 2000. Montreal: McGill-Queen’s Press, 2008. Harris, Douglas C. Fish, Law, and Colonialism: The Legal Capture of Salmon in British Columbia. Toronto: University of Toronto Press, 2001. Harris, Douglas C. Landing Native Fisheries: Indian Reserves and Fishing Rights in British Columbia, 1849-1925. Vancouver: University of British Columbia, 2008. Harris, Douglas C. “Food Fish, Commercial Fish, and Fish to Support a Moderate Livelihood: Characterizing Aboriginal and Treaty Rights to Canadian Fisheries” Arctic Review on Law and Politics 1 (2010): 82-107. Hubbard, Jennifer. A Science on the Scales: The Rise of Canadian Atlantic Fisheries Biology, 1898-1939. University of Toronto Press, 2006. Koenig, Edwin C. Cultures and Ecologies: A Native Fishing Conflict on the Saugeen-Bruce Peninsula. Toronto: University of Toronto Press, 2005. Kinsey, Darin. “ ‘Seeding the Water as the Earth’: The Epicenter and Peripheries of a Western Aquacultural Revolution.” Environmental History 11, No. 3 (2006): 527-566. Knight, William. “Samuel Wilmot, Fish Culture, and Recreational Fisheries in Late 19 Century Ontario.” Scientia Canadensis 30, no. 1 (2007): 75-90. MacDonald, Douglas, David McRobert, Miriam Diamond. “How Ottawa fumbled the fisheries file”Globe and Mail, Friday July 6, 2012. McEvoy, Arthur. The Fisherman’s Problem: Ecology and Law in the California Fisheries, 1850-1980. Cambridge University Press, 1986. Newell, D. and R. Ommer. Fishing Places, Fishing People: Traditions and Uses in Canadian Small-scale Fisheries. Toronto, University of Toronto Press, 1999. Parenteau, Bill. “’Care, Control and Supervision’: Native People in the Canadian Atlantic Salmon Fishery, 1867-1900.” Canadian Historical Review. 79 (1998): 1-35. Parsons, L.S. Management of Marine Fisheries in Canada. Ottawa: National Research Council of Canada and Department of Fisheries and Oceans, 1993. Piper, Liza. The Industrial Transformation of Subarctic Canada. Vancouver: UBC Press, 2009. Rose, Alex. Who Killed the Grand Banks? : The untold story behind the decimation of one of the world’s greatest natural resources. Mississauga: John Wiley and Sons, 2008. Siddon, Tom, David Anderson, John Fraser, Herb Dahliwal, “An Open Letter to Stephen Harper on Fisheries” Globe and Mail, June 1, 2012. Wadewitz, Lissa K. The Nature of Borders: Salmon, Boundaries, and Bandits on the Salish Sea. Vancouver: UBC Press, 2012. Young, Nathan and Ralph Matthews. The Aquaculture Controversy in Canada: Activism, Policy, and Contested Science. Vancouver: UBC Press, 2010. New Directions in Marine Environmental History Forum. Environmental History 18.1 (2013): 3-126. Kheraj, Sean, Stacy Nation-Knapper, and Andrew Watson. “Episode 35: Histories of Canadian Environmental Issues, Part V – Fisheries, Regulation, and Science” Nature’s Past. 28 February 2013.